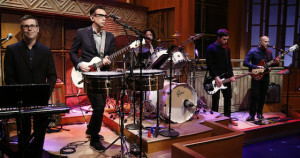 One of my cooler recent freelance assignments was writing a short piece for Variety on Fred Armisen’s new stint as bandleader on Late Night with Seth Meyers. I had a really fun conversation with Fred (by phone), and was only able to use the scantiest essence of it for the article. So, for your reading pleasure and enlightenment, here is comedian/actor/drummer Fred Armisen on the nuts and bolts of his new gig, the very specific punk song influences on the theme song he wrote for the show, assembling the 8G Band, his well-oiled improv chemistry with Meyers, and why he thinks stress should be embraced. Tim Greiving: Was it Seth Meyers himself who contacted you about the gig originally? 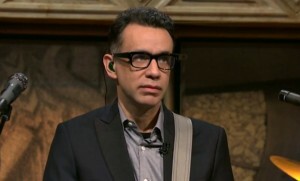 Fred Armisen: No, first it was my manager, and then it was Lorne Michaels. I think they had been discussing it—it wasn’t official for a while, so I think they were talking about it. And then I went and met with Mike Schumaker and Seth, and we had this great meeting, and I thought, This will be great. TG: What was the pitch? FA: It was very last minute. It might have been two weeks before the test show, maybe three weeks, but I feel like it was two. And then the pitch was: Do you want to help curate a band and write a theme song for Late Night with Seth? I’ve always wanted to write a theme song for a TV show, so that was the first thing that attracted me to it—aside from, of course, it being Seth, who I love, and Lorne, who I want to always work with. And then the word “curate” I really liked, because I think they understood that I’ve got these other things I’ve got to do, like Portlandia, so “curate” sounded very much like I could put together the aesthetics and the sound for something, without having to be there every single day. TG: Yeah, I’d read that description of “curator,” and wondered what all that entailed. FA: It’s like designing, like sound designing—it’s almost like making a blueprint. It’s like doing an outline. If you were to do a drawing that was going to be filled in with colors, it’s like doing the magic marker outline of it. And it’s really what I love doing. And I also love being there every day. When I said I don’t have to be there every day, it wasn’t like that’s a chore. It’s more like, the days that I’m not there, I’d want there to be like a sound that echoes through. 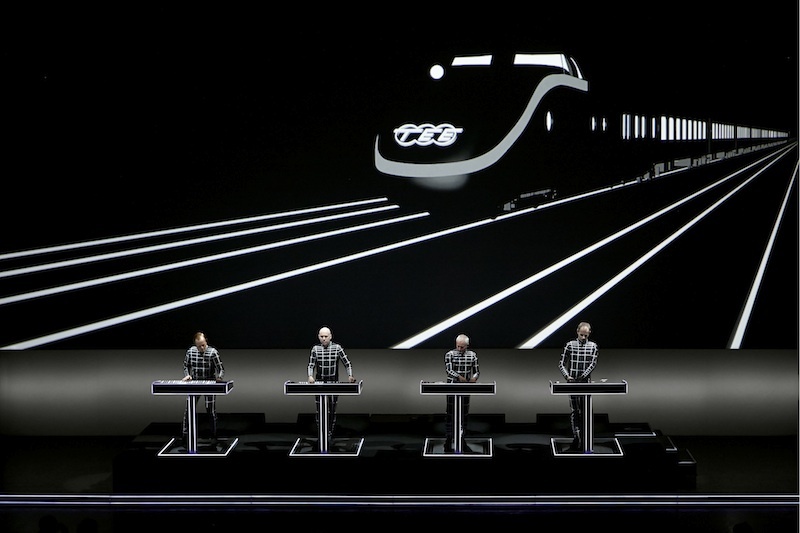 TG: What was your process finding the theme song and the overall sound for the show? TG: I don’t know that one. FA. Ah. Well, you’ve got to go find the Big Boys. There’s an album called The Fat Elvis, and it’s this brilliant song where the first chord, even though the tempo’s fast, it still has a mystery to it. You actually don’t know where the song’s going to go. ’Cause I thought I wanted it to be a punk song, but I also didn’t want it to be an empty punk song. Like I wanted the sort of optimism and melody that ’90s punk had. Even though Big Boys is more early ’80s. But I think that as punk bands across the country started to do their versions of what punk is—Big Boys are a Texas band—Texans had a very party-positive angle on what punk is. And I think that’s the original intent of punk. I think that, as political as it became, and all the different avenues that it went down, I think The Damned and Captain Sensible spelled out that it was something that was supposed to be celebratory, something to celebrate. It was a movement against anything that was morose, so that positivity kind of went through different faces throughout the years, but in Texas—and the Big Boys especially—I feel like they kind of turned it into something that was optimistic. So the question mark of “I Don’t Know Which Way to Go” by the Big Boys is a good opening chord, of like, “Okay, which way is this show gonna go?” And the end result is that it’s something filled with optimism, which reflects what Seth Meyers is. Seth Meyers is not a cynic. He supports everything. And I think the Big Boys message eventually transformed into what the Minute Men were doing, and I think even the Red Hot Chili Peppers, because even though they existed in different punk scenes, that seed of positivity kind of echoed. Then the next part was a little bit of Generation X (the band). Then the third part to the guitar part was an echo of this XTC song called “Making Plans for Nigel.” There are guitar solos and guitar leads, but I feel like New Wave embraced repetitive guitar lines, which is maybe even African or something, but when guitar lines go over and over again—”Making Plans for Nigel” does that throughout. There’s this one little guitar line that just repeats all the way through, and it’s very pleasant to listen to. The next part after that is a little Sleeter Kenny, and just like a general modern rock line. Then it repeats. Then the very, very last chord that you hear that goes [“duh-nuh-duh-nuh-nuh”] is Circus Lupus. It’s like a salute to Circus Loopus. And Circus Loopus rounds out the whole thing because, the band is mostly Washington D.C. members, and I feel like a lot of ’90s punk towards the end—maybe the mid-’90s—sort of looked up to the Washington D.C. scene. And I don’t have any members of Circus Loopus in the band, but it was a sort of punctuation, that the framework is Washington D.C.
TG: For some reason I want to say “punktuation” with a K.
FA: Oh, go for it. That’s your right. You could even put like, on the A, you could put a circle around it if you want to make it look like Anarchy. TG: That’s an interesting concoction of influences. Is there a long version of the theme song? FA: No, but I think there’s a version that was a little longer, but we already had parameters. It was written as a theme song, so it can only be 30 seconds or something. But I think my shortcoming as a songwriter is that I can only write in short pieces. So for sketches for SNL, and just in general, I don’t have the ability to write long pieces as a real songwriter would do. So it actually fits the way that I think. So the reason to write a theme song for a TV show wasn’t just my ego—it was part of it. But it’s also that it kind of fits with the way I think musically—these 30 seconds or 1 minute of music. You know what I mean? There are people who are equipped for long pieces, but that’s not me. TG: Are all the pieces you play throughout each episode original? FA: They are. The whole band writes those. That’s all of us together. We write songs all day. We write five songs a day. TG: Describe your process, your day-to-day routine. FA: We go in at 11, to this rehearsal studio. We know we’re very limited on time—we know that a car is picking us up at like 3. So we look at the list for the day, the list meaning how many commercial breaks … this is where it’s most clinical. It’s Eli Jenny on keyboard, Seth Jabor on first guitar—I call myself second guitar—Sid Butler on bass, and Kim Thompson on drums. We go in, get all the amps and everything going. And because we’re limited on time, we sort of carve out what we need. “Okay guys, we need five commercial breaks, and three walk-ons.” Walk-ons being what people walk out to. The show can’t afford many covers. We’ve only done two. So we have to write most of them. Luckily they’re instrumental, and luckily we all want to write. So, you know, Seth will say, “I had this guitar line,” and he’ll start playing it. And because we’re limited on time, we can’t even entertain not doing it. We go, “Great, yes, that’s beautiful. What if you did this on bass?” Kim will come up with a drum beat. “That sounds great.” So we’re all adding a thing. Then we come up with a B part. “Okay, that’s beautiful.” (This is me talking in practice) “I’ve been obsessed with salsa music. Maybe we could have a little Latin part in it.” “Great. Let’s do this.” “Hmm, I think that maybe that’s a little too negative. Let’s go a little more major key for that.” “Wonderful.” “Great.” Then we all record it on our phones. So we all have the song, A and B part. “Got it.” Then I’ll call out the changes: “A part, B part, A part, B part.” Then we look at it and we go, “Okay, this sounds like a song. What do you want to call it?” “Let’s call it ‘Gang of Baristas.’” “Great. ‘Gang…of…Baristas.’” “We need another one. Now we need a walk-on.” So that’s what we do. We record into our phones, and then write it down in our phones. TG: Do you have carte blanche? You mentioned salsa…what are your boundaries as far as what the sound can be? FA: We want it to jut out a little bit, because the sound quality on a TV is not great. So we have to kind of come up with melodies and beats that really are sharp, so it sort of makes itself known through the speaker. Other than that, we try to keep the tempo either at up-tempo, some salsa stuff, some Latin influence, some reggae, some kind of dub beats—because when it’s sparse you can really hear everything. We try to keep it kind of angular. Sharp and angular, just so there’s something to hold onto. And I’m a fan of melodies, so I like it when Seth Jabor does a nice melody on guitar. He’s a brilliant guitar player, he’s very ornate, which is kind of nice. And we try to do things where one musician will shine. Something that Kim starts, something that Eli will start. Just so we can get a sense of the instrument. TG: How was the band assembled? FA: I texted Eli. I texted Sid. I texted Seth. And I’m not kidding. I think I might have emailed Eli, texted Sid, texted Seth. And I said, “What are you guys doing this week? Can you get together very, very soon?” Then drummer-wise—I’m really a drummer, not really a guitar player, and I thought maybe playing the drums was a little too similar to The Roots, you know, Questlove. Just, “Oh, here’s another drummer.” I just thought since The Roots are so great, we should try as much as we can to get as far away from that territory as we can, because there are things we’ve definitely mimicked and emulated, but I thought, Well, let’s start with me not being on drums. Let’s just start there. And it gave us a good opportunity to get someone on drums who isn’t from the same school as the rest of us in the band. You know, we’re all kind of the same age, we’re from this punk scene from the ’90s—me with Trenchmouth, and then the two guys from Les Savvy Sav, and then Eli from Girls Against Boys. If we filled it in with another one of that, it was going to be not interesting to hear and look at. Like, you’ve got to change it up a little bit, otherwise it’s just one thing. So it was a good opportunity, and right away I thought, Well, what about a female drummer? I know it’s a blunt thing to say in an interview or to like address, but I was like, Four dudes so far, let’s stop at that. And I remembered seeing Kim play, and we just had her audition. We had some other people who auditioned as well, who were also great. But we had to think local, because we can’t really afford to have people from out of town. And she was just great, and we were very lucky, very fortunate to have her. TG: I have to say, it’s fun watching her hair whip around while she drums. That’s an extra visual treat. FA: It is a visual medium, so it’s like, we’ve got to think in those terms. Plus, a band is only as good as its drummer, and the drummer is the most interesting part of any band. It’s who people look at the most, it’s who people listen to the most. When I watch the show and I hear it, it’s what you hear the most. So the drummer really has to be the center point and the most exciting part of the band—and she is. She’s great. She’s a brilliant drummer. When we say, “Oh, let’s try something that’s a little bit reggae,” she kills it. She’s just so brilliant at it. We say, “How about something that’s a little Latin?” She knows Latin like I’ve never heard it before. She never turns to me and says, “I don’t really know salsa.” She knows salsa better than anyone I’ve played with. So it really gets our blood going. We got very lucky with her, we really did. TG: What’s the origin of the band name? TG: So that’s not referencing anything at all? FA: Oh, I’m so sorry, 8G is the studio. I am so sorry—my tone is that I keep thinking everyone works at 30 Rock, and I’m so sorry. Yes, it’s Studio 8G. So SNL is 8H, and it’s on the same floor, and it’s 8G. I should have made up something. TG: You really should have. You had an opportunity there. TG: Well, I wish I knew 30 Rock as well as you do. TG: I don’t think so. FA: You gotta dream big. TG: Well, since you’re on guitar and not drums, how exactly does leading the band work? FA: It’s coming up with set lists, you know, what goes where, what goes with whom. The other thing we tried not to do is, you know, because The Roots are so good at choosing songs that fit the guest stars, that’s their territory. So I thought, Let’s just come up with songs that have a good beat to them so that the guests have something to walk out to that is kind of up, you know what I mean. And I can’t stress enough how amazing the house that The Roots created, how huge it is. They really just reset everything. Their attitude, their energy, the amount they work… I got some advice from Questlove, and they’re just incredible. We all look up to them. So bandleader-wise, it’s like: I have two microphones, one for singing (you know, when we do the warm-up show), but then there’s another microphone to only talk to the band. We write up this setlist, and I’ve got to count the band in and out. So the stage manager will say, “Five seconds to commercial,” I get the band ready, “Okay everybody, here we go. We’re going to do ‘Gang of Baristas,’ here we go. One, two, three, four…” and we all start. That’s how that works. Then we play and we play and we play, and I look at the stage manager, then he says, “30 seconds back to the show.” I tell the band, and then it’s another count-off to end the song. So, “Let’s stay on this part. Let’s stay on part B. Here comes the ending, here comes the ending…1, 2, 3, 4, end.” Sometimes you’ll catch it on camera—you’ll see me talking, and that’s what I’m saying. FA: In a way it is live. That’s the part you don’t need to be redoing while the crew is waiting, to wait for the band. So yeah, it is live. And there are real musicians playing, and mistakes can be made and have been made. And you want it to sound good. So it’s the good kind of nerve-wracking. I want that pressure, I want to be stressed. So I’m stressed and I want to be stressed. TG: You have the other aspect, the comedic, on-camera banter. Do you sit in on writer’s meetings for that? FA: No, no, no. It’s purposefully they don’t tell me what’s coming. They don’t tell me what Seth is going to say. TG: So it’s all improv? FA: Uh-huh. Even if they know what they’re going to say, I never ever, ever know at all. You can see it on my face, where I’m like, “Oh…yes, this thing we’re talking about. Yes, as a matter of fact, yes…” I don’t know what’s coming. TG: Interesting. Did you volunteer for that role? FA: It just happened because—I don’t know whose idea it was—but Seth and I just have a shorthand. You know, we’ve known each other a long time, and we make each other laugh. So in a way we’ve been doing it for 13 years or whatever. That’s been part of our conversation, so we’ve been rehearsing for it our whole lives…or whatever, these 13 years. TG: That’s cool that you bring that into the show, which is sort of a blank slate, but there’s an established chemistry sort of anchoring it. FA: Yeah. He’s my friend and he makes me laugh, so what could be better? TG: So it sounds like you don’t improvise at all with the music—that’s all written out and planned and purposefully timed—but then the comedic part is all improv. FA: Yeah. Well, any musician will improvise a little bit on their instrument. But really no. There’s a structure to the songs, and they have to sound like we’ve been playing them for years…when we’ve really just learned them that day. TG: Is “Gang of Baristas” a real song title? FA: “Gang of Baristas” actually was a real song title, because we wanted it to sound like “Gang of Four,” and then…I don’t know. Who knows. I don’t know why we said baristas. One of us might have been holding a cup of coffee or something. 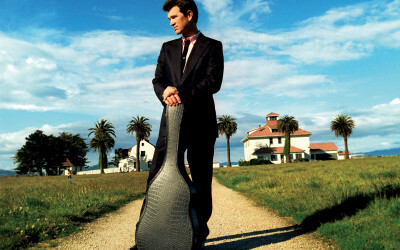 The song titles do come from things like that, like, “Oh, this sounds like this band, and uh…I’m holding a suitcase. So let’s call it ‘Something Suitcase.’” That kind of thing. FA: Yeah, it’s been happening already. Like last week I had to go do a show in Minneapolis, and then my friend Marty Stern filled in on guitar. So then Eli fills in on the leader’s spot, of calling out the beginnings and endings. Which is another reason I’m glad I’m not playing drums—as much as I love the drums. That’s a harder instrument to fill in on, ’cause it’s a whole drum set. You know, guitar lends itself more to like, “Here, just plug in your guitar and you’ll be fine.” Drums…you need that anchor. So when I go to do Portlandia, I’ll just go do that. And I made sure it was okay with everyone. But also, it’s all the same umbrella of production, so nobody is upset. Everyone just said, “Oh great.” My whole life has been this way, so it totally works. Personally, it works better for me anyway, ’cause I think I work better if I’m juggling and doing many things at once. It’s the same for Carrie Brownstein, it’s the same for Jonathan Chrysler—we all do things, and then we treat Portlandia as a sort of summer camp, where we all reconvene. TG: How big a part of your identity is music, relative to performing and comedy? FA: It informs everything I do, ’cause I began my career as a punk drummer. So even though I wanted to be on television—my whole life I’ve wanted to be on television—but for some reason I thought it would be through music. And I guess it has turned out that way. But my heart has always been being a punk drummer, and that’s always lived on—not just in drumming—but in the way that I wanted Portlandia to be marketed, the way that I wanted sketches to be… I’ve always come at it as a drummer. 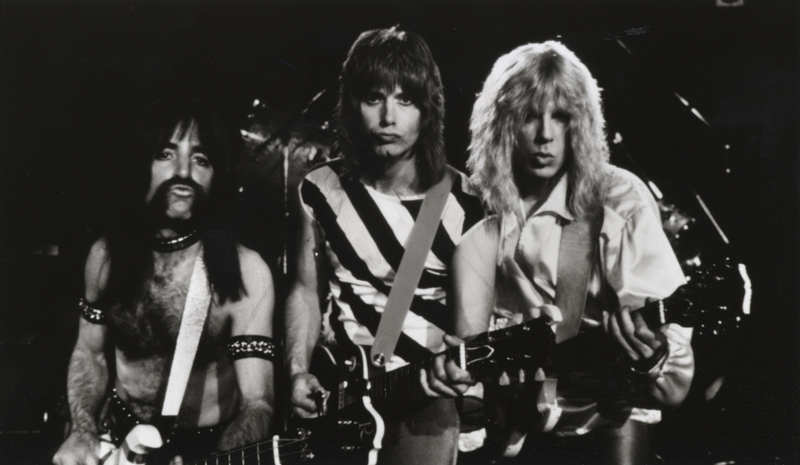 Pitch meetings with Lorne Michaels and SNL cast and crew, even then, deep in my heart I’m always a punk drummer. Because drums is not separate from that. Drumming is all about getting attention. So if you think of the best drummer in the world, if you think of your favorite drummer, it’s someone who wants attention. Cymbals and drums, if you think about it, it’s like you’re hitting things for attention. Drummers are usually on a drum riser, you know, it’s like it’s not enough that they’re sitting down playing these cymbals, they’re on a riser. If you think of the best drummer in the world, it’s someone who, in a way, was giving a performance…and that’s Keith Moon, right? If you think of Keith Moon, he created a cacophony of noise, and he really demanded to be center stage. I think comedians all have an element of drummers to them. There’s humility of like being self-deprecating, but then there’s also the grabbing the spotlight. As opposed to a lead guitar player, who you would think is naturally in the spotlight. People don’t look at the guitar player—they look at the drummer. TG: But you’ve sort of subjugated that attention-seeking role for this position. FA: Yeah. No…because I’m still a drummer. I’m a struggling guitar player. I don’t play guitar that well. I’m a drummer. But I’m playing guitar. Plus, I feel proficient enough at the drums that I’d rather play an instrument I don’t know how to play, because…I think a musician should always pick up an instrument they don’t know how to play, because that’s when the most interesting things come out. TG: Plus we’ve established that you like stress. FA: [Laughs] Yeah. I think stress does bring something out in people. I think comfort doesn’t help. I think stress makes people stand up and move towards something. TG: Well, you said you dreamed of being on TV—did you ever dream of being a bandleader for a late night talk show? FA: I always looked to Devo. And this is just my age, this is just what I grew up on when I was a kid. I looked at Devo, and I looked at David Byrne, and the Clash, and Stewart Copeland… I looked at these people, and they were always just making things, and they were very visual. So whatever this job position is called, all I know is that it’s with Lorne Michaels, it’s on NBC, and it’s making music with punks—and I include Seth in that. So whatever this is called—bandleader, whatever it is—I love it. And yes, I love television, I love punk, and I love comedy. And if I get to do it, lucky me. Lucky me. Every minute of the day.